Such a fun easy treat the whole family will love, especially the kids! Traditional rice krispies treats are tinted orange, shaped into rounds and topped with a pretzel stick and shaped green candy, such as airheads (or green fondant). 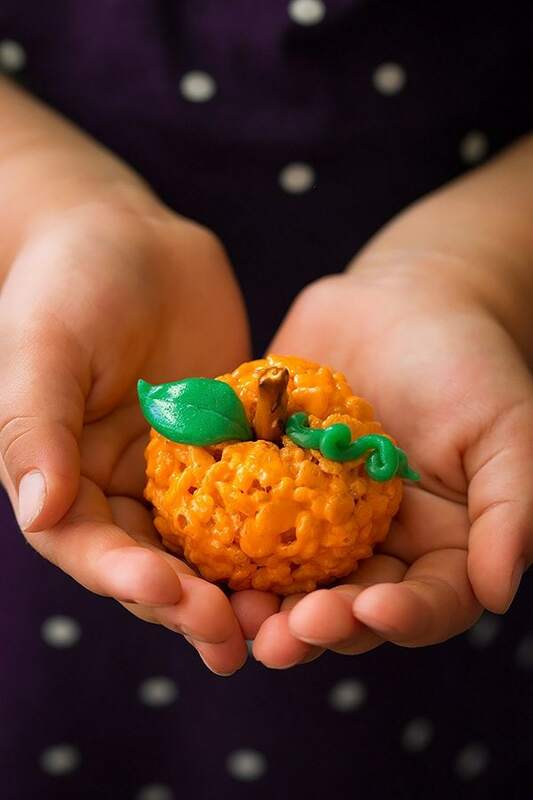 Perfect for Halloween and Thanksgiving parties, or a weekend edible craft. 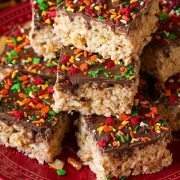 No matter how old you are rice krispie treats never get old! I still make them all the time for a quick treat and I’ll never get sick of them. Whenever I take them to a party they disappear in no time (ugh and I can never stop at just one). 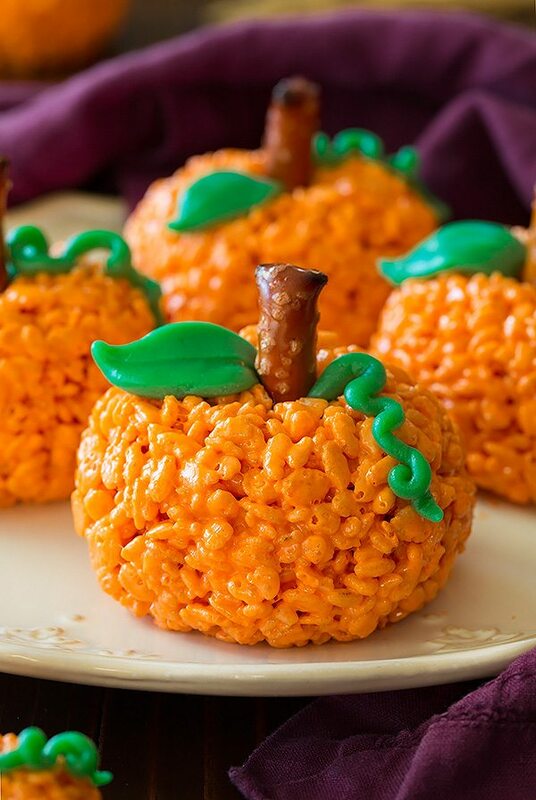 Here I’ve made them into a fall inspired treat that both young and old alike will love! 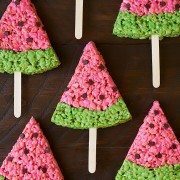 I’ve mentioned in the recipe if you are making them for adults I’d use the marshmallow fondant then for kids just the green airheads like that pictured. 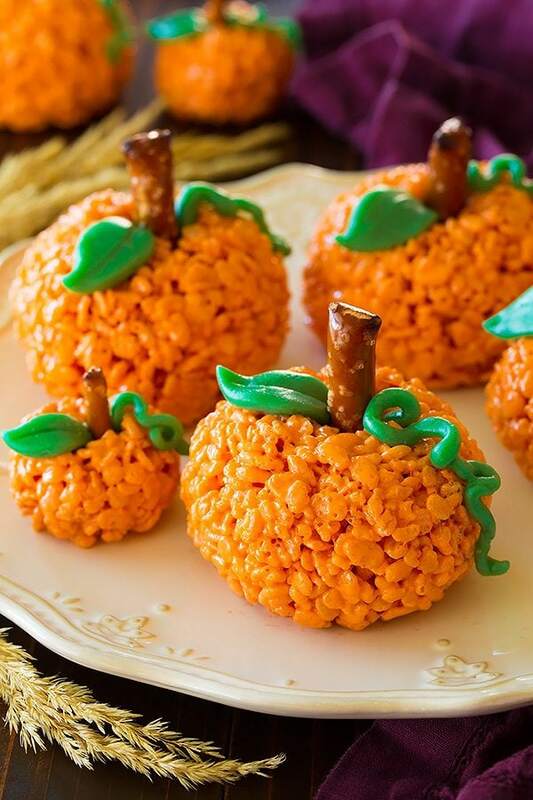 These Pumpkin Rice Krispie Treats don’t have any pumpkin in them but rather they’re just shaped to look like a pumpkin so you still get that same sweet vanilla marshmallow flavor. 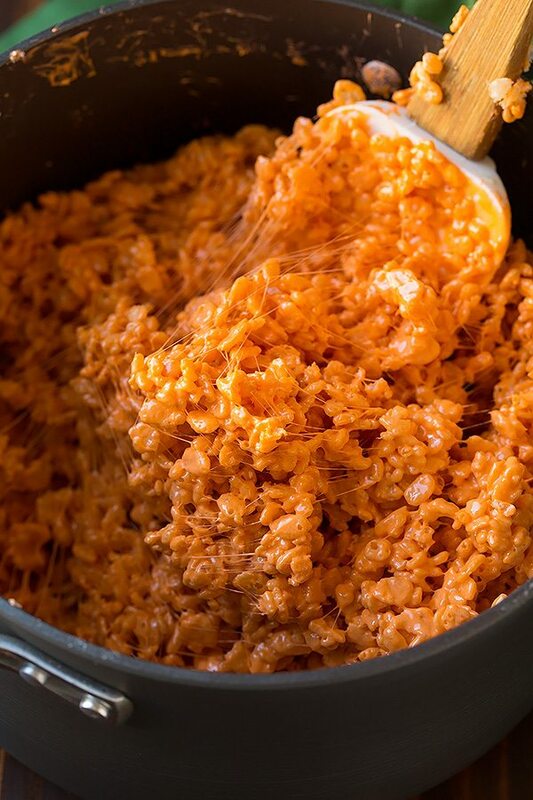 I’m assuming if you did mix pumpkin into rice krispie treats they’d probably almost immediately go stale and the consistency and everything would just be off. You could add a little pumpkin pie spice though. I bought a few different ingredients trying to figure out which would be best for the stem. I got mini twix, red vines black licorice, pretzel rods and I’ve also seen tootsie rolls used. I decided the pretzel looked the best plus it was a nice balance to have a little salty to balance out all the sweet. If you want to make mini’s just make them about golf ball size and use mini pretzel sticks instead of the pretzel rods. I’m not sure how many minis you’d get but probably about 3 or 4 times what you get from the baseball size ones. 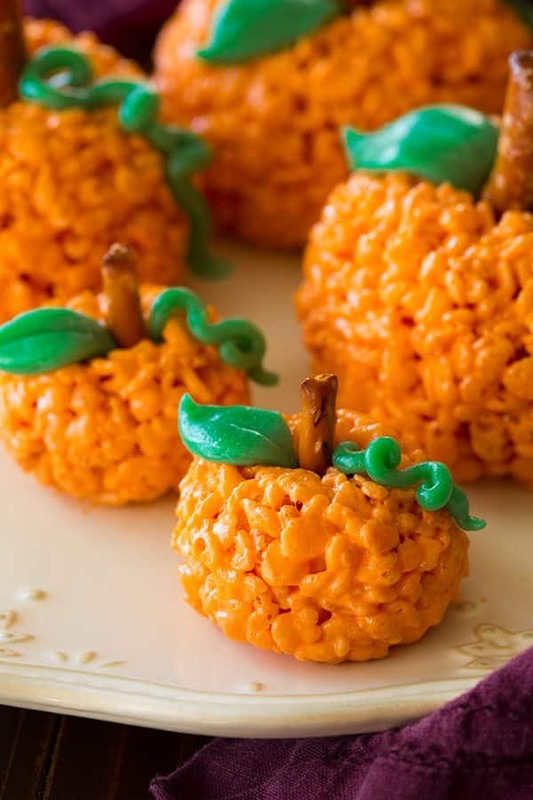 You should make these with your kids at least once this fall. It’s such a fun treat to make together! 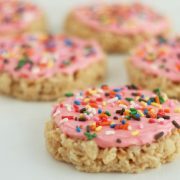 More Rice Krispies Treat Recipes to Try! Measure out rice krispies cereal and pour into a bowl. Melt butter in a 4 quart non-stick saucepan or pot over medium-low heat. Add marshmallows and stir and as they begin to melt start adding in the gel food coloring until desired color is achieved. Stir constantly until marshmallows have melted. Remove from heat then immediately pour in rice krispies cereal and gently stir and fold with a spatula until cereal is evenly coated. Let mixture cool slightly (until it's cool enough to handle with your hands). 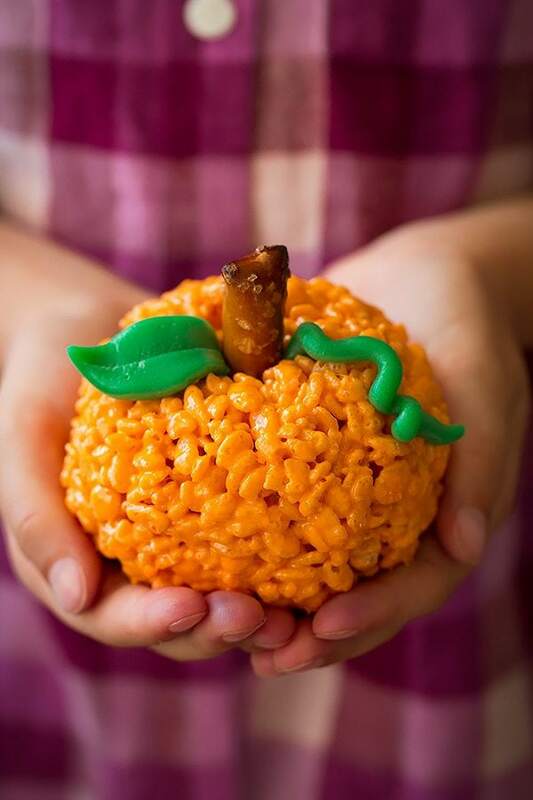 Spray hands with non-stick cooking spray then shape rice krispie treat mixture into balls about the size of a baseball, then insert 1 piece of the pretzel rod into the top center and reshape the pumpkin as needed. Transfer to a plate or dish sprayed lightly with cooking spray. Beginning on one side of the airhead candy cut out a leaf shape with clean scissors then use the remaining portion of the piece of candy to roll and shape into a thin rope shape then twist into a vine shape (or just shape the fondant accordingly, no cutting required). Place candy on the sides of each pretzel on the pumpkin (as pictured). Repeat with remaining candy. Store in an airtight container. *If making this for kids I'd just use the airheads because they usually like the taste of them, if making it for adults I'd recommend making 1/4 a batch of this fondant recipe (it's the only fondant recipe I like) and tinting it green - it tastes better than the airheads.